The Public Relations Wing manages the corporate communication activities of Kerala State Electricity Board Ltd through an effective use of conventional and new media. It has a unique place among the PR units of Public Sector companies in Kerala. 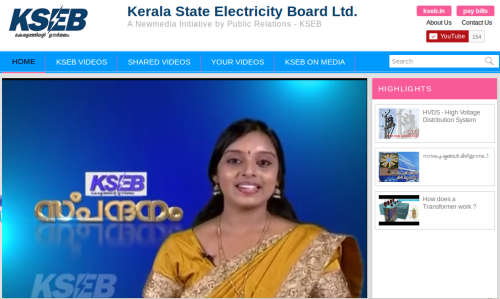 KSEB PR Wing has the rare distinction of having an Internet based video channel (www.ksebmedia.in) . The Facebook page of KSEB, (https://www.facebook.com/ksebl) managed by the PR Wing, has over 1.16 lakh subscribers – undoubtedly, the largest among the Public sector companies in Kerala. KSEB also uses Twitter ( https://twitter.com/KSEBLtd) to communicate to the public. Besides these new media initiatives, the PR Wing also telecasts on behalf of KSEB, a weekly half an hour television programme (Spandanam) on Doordars han on Saturdays and Sundays. The Public Relations Department, headed by Chief Public Relations Officer, has three sections :. 3. Front Office, Hospitality and Liaison. The PR Wing issues official Press Releases and all advertisements including Tenders, disciplinary proceedings, statutory notices etc., as per prevailing norms. Release of Display and Special advertisements in connection with various activities of KSEB, is also handled by the PR Wing. The Demand Side Management Campaigns of KSEB are carried out by the PR wing. Over the years, the PR Wing has conducted several such campaigns. The Labhaprabha campaigns of 2013 and 2014 are recent instances which received state wide attention and participation. Many campaigns related to Electrical Safety have also been carried out by the PR Wing. As part of such campaigns, the PR wing engages in publication of booklets, brochures and other materials and conducts interactive sessions in various localities. The major achievements of KSEB are highlighted through news, features and advertisements in all classes of media. The company's active presence on the social media platforms ensures ready feed back from various types of publics. The Facebook page of KSEB addresses such feedback and also generates discussions on matters which need to be brought to public attention. Feed back in the form of news clippings of every day is compiled and provided to the top officers of the Company and to the office of the Hon'ble Minister for Power . The PR wing also brings out publications . Besides the works like compilation of Board Orders and Circulars, Guidelines for the Preventive Maintenance of Hydro Electric Power Stations etc., the Wing has been regularly publishing Spandanam, a newsletter for State wide circulation. Photographic and video coverage of major functions have resulted in a compilation of albums and CDs. Hospitality is another area handled by the PR Wing. It reveives significant visiting dignitaries, and arranges transportation and accommodation to them as and when required by the Chairman & Managing Director or the Minister for Power. Exhibitions and Event Management also form part of the activities of the PR Wing. In addition to the farewell and reception functions in honour of the top officials of KSEB, the PR Wing also manages the conduct of major conferences, Pres Meets and other events. As an outreach activity, the Department also coordinates the conduct of Exhibitions of KSEB in all significant festivals and Trade Fairs including those held in other capital cities in the country. The Reception wing forms an integral part of Public Relations Department. It ensures the effective front office management at the KSEB corporate office by imparting information and managing visitors. The work related to the implementation of Malayalam as official language is also carried out in the Public Relations Department.